Do you know if a separate virtual server (besides the Gateway virtual server) is required? And additionally which IP-address is to be configured where? Where does the “RDP IP” in the server policy need to point? And what is the “RDP Host” in the client policy? Too many required addresses/names and too little documentation so far… If you can answer any of these questions it would help me out. This functionality is meant to replace/emulate the RDS Gateway functionality right? Not to act as a portal towars the RDS Gateway. Yeah, it’s definitely a work in progress, and has added stateless functionality as of the 10.5 53.9010 release by way of using a STA to pass credentials between gateways. Just bear in mind that if you upgrade to 53.9010 that you’ll need to rebuild your RDP profiles. 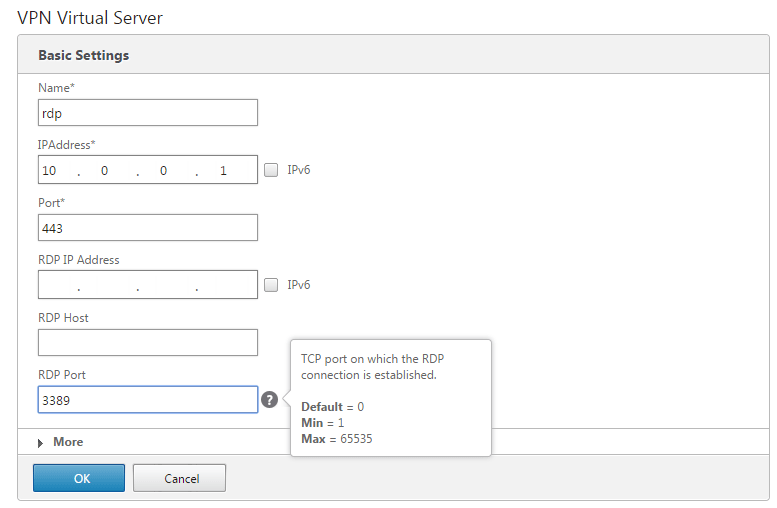 Basically you apply the RDP server profile to the vServer that will host the RDP proxy service, with the RDP IP being the VIP that will actually accept RDP proxy connections, vs. the vServer IP being the web portal VIP. Yes, this is a solution that effectively replaces RDS Gateway. Just bear in mind that it can’t enforce client settings (no ‘virtual channel lockdown’), so you’ll need to apply any restrictions on the server side. Where are you stuck? Basically you specify an rdp client profile on your CVPN vServer’s session profile, and the rdp server profile to the rdp proxy vServer (if it’s different). Also, as of the latest release you also need to specify a matching pre-shared key to both, so as to allow for encryption of the XML blob that’s sent to/from the STA. Do you know if this RDP Proxy feature is available in the Standard or only the Enterprise edition of VPX? 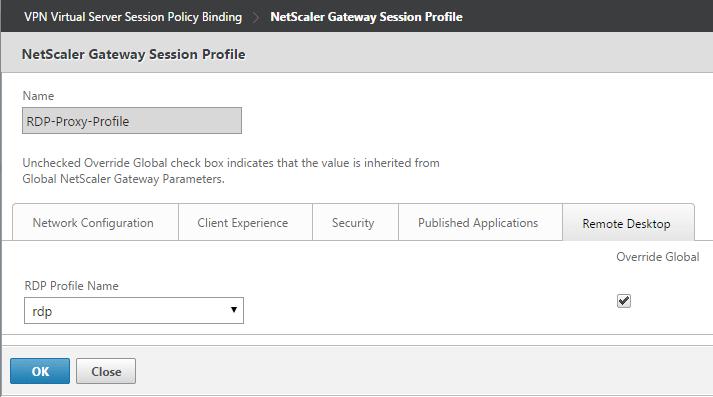 Ah, sorry I misunderstood the question; it’s included with NetScaler Gateway CCU licenses. Not with XP in particular, though the session host’s platform shouldn’t matter as it just needs to be compatible with the client. Does the mstsc status message change prior to failing? Does it fail immediately, or after a period of time? Are you using STAs, and if so are they happy/healthy? Does this support Remote app connections to? and i suppose it wont require running from IE as RDweb does? There is no browser dependency (besides the handling of the .rdp file), and though I haven’t tried it with RemoteApp, I’d be surprised if it didn’t work. Really good post. I have a question regarding getting fetching the .RDP file on the client. The problem I have is that I do not know the actual ipaddress of the VDA hosts nor the domainname. Is there any API on the netscaler that I can call to query the address of a host? What I am trying to achieve is for a given published app for a user, I want to download the RDP file? Do people has this working with remote apps / rdp desktop including Single Sign on? RDP desktops work fine with credssp single sign-on. I haven’t tested remote apps, but would assume they’d work as well.